This is a commission slot. You can hire potatacheep to create a personalized artwork of this sort here. The artist will most likely respond to a request within 3.0 days. This commission slot was rated positively by 37 clients thus far. HD JPG of the sketch ver and colored ver. 350 dpi, size of 2000 x 2000 pxl or above this size, depending on the commission type. The base price is for a headshot / up to the character's shoulder. Took a while but was understandable due to circumstances definitely worth the wait! Such a amazing and talented artist! Amazing result and you can't beat the price ?? Absolutely gorgeous artwork and tons of communication. Loved the piece! Wonderful to work with, and very understanding. Final product turned out amazing. Very beautiful art and great service!! This artist is absolutely amazing and adorable. They are quick and professional. They sent me wips of the adjustments and everything before coloring the piece beautifully. They brought my dear character to life with ease! I highly reccomend this artist! The results are simply amazing. A really wonderful and kind artist who kept me updated along the way making sure I was happy from start to end with their wip. It's not often that I get emotional over sn art piece, but this one surely did. The attention to details is flawless! Very beautiful and outstanding work. The colors and their style are absolutely beautiful. They brought my characters to life, I'm so happy with the results! They managed to capture my ocs perfectly from the looks to their personalities. Even better than I had imagined. :) will definitely commission more in the near future and highly recommend to anyone. Outstanding, absolutely outstanding. Would give over a 10/10. A+++++ Thank you so so much!!! Super lovely individual! Their art is beautiful and completely met and exceeded my expectations! Was great to work with and a wonderful experience! First time commissionning someone on the platform. Potatacheep was really kind, understanding and patient with me. The whole process went really smoothly, and the commission was also done very quickly, I'm impressed! Especially since the artwork in itself is beautiful, exactly as expected. Highly recommended !! Amazing and adorable work! Love the outcome so much, everything I wanted and more! Very nice to talk to and delivers a great product! Nice artist who work faster and do awsome art ? Artist had some troubles in real life that caused a delay starting the process but once everything was alright for them I was given the sketch and then they finished it quickly! 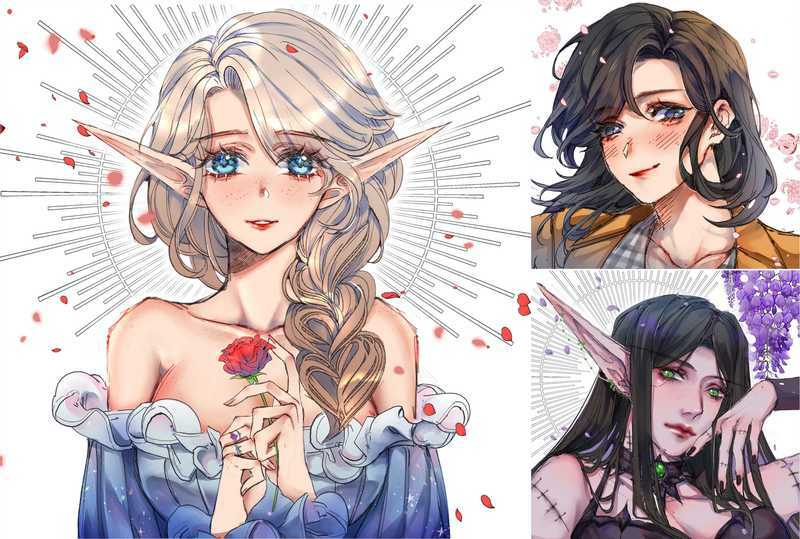 Their art is very pretty and dreamlike, I love it. Super happy with the outcome, great communication and attention to detail, thank you so much! The artist had some stuff come up RL but still gave a beautiful end piece that I'm very happy with. Would recommend and visit again, it's truly worth the wait. The commission is absolutely lovely and the communication with the artist is fast. I wasn't clear about some details so it took a bit longer but the artist made great work! I'm happy with the outcome. artist worked crazy fast and the piece turned out better than i ever could've imagined! would absolutely recommend! ? Very good and fast artwork. I was very happy with the result. A wonderful artist! Please commission! Wonderful artist with amazing artwork!!! Highly recommend!!! Super nice and friendly person and AMAZING artist hands down my favorite without any doubt thank you again! Amazing artist! Totally nailed what I had envisioned for my commission. 10/10. Beautifully painted and listened to all my concerns to get the art just right! Incredibly cute style, the artist was very pleasant and made sure that everything was exactly what I wanted. Definitely will be getting another commission in the future. These are so so precious and cute! Did an amazing job and was a joy to work with. I have never been so happy with a piece before. Recommend completely! Very kind and fast work, gorgeous material. Vas very glad to have commissioned them! This artist has a great eye for detail!Great with communication and the final product is so gorgeous, I can't even express how delighted I am! ? Highly recommended. ※ First come first serve. I need 3 - 7 days to finish one commission, depending on the difficulty. If you are on waiting line, it might takes a while. I will inform you the date when i will start working on yours, i will also put my commissions progress on my profile bio so you can see how the progress going on (i will hide your name if you want me to). ※ IMPORTANT : sometimes i upload the finished commission to my socmed account for portfolio. I give watermark and credit when i did. But if you want to keep it private, please inform me in advance since there will be additional fee ( for +5 usd ).